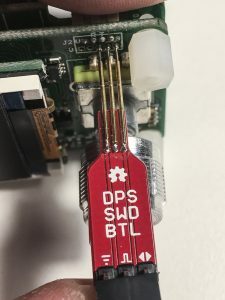 On newer DPS:es, the SWD connector is a JST-GH (1.25mm spacing that is) which translates to “really tiny”. The annular rings where you need to apply solder and heat for adding wires are even smaller. This is why the OpenDPS SWD Bottle is handy. Add three P50-E2 pogo pins, and connect to your favourite SWD debugger. Add solder to each of the three exposed pads where the pogo pins will be mounted. Hold one pogo pin with a tweezer or small plier an align along the pad. Apply heat on the pad and when the solder reflows, gently push the pin in place and wait for the solder to cool down. Repeat for the second pin and check alignment of the two pins on your DPS. Repeat for the third pin and check alignment on your DPS. Solder the 0.1″ header on the reverse side of the pogo pins. Well it looks like a bottle, doesn’t it? The pinout is described on the silk and you should be able to make out which is GND, SWCLK and SWDIO with a little imagination 🙂 The DPS BTL shall be interfaced with ground to the left touching with the middle annular ring of the DPS SWD connector. See the top image. Soldering the right angle header on the suggested side helps you in pressing the adapter against the DPS with one hand only. I have been playing with the thought of selling some of my prototyping stuff on Tindie or some other maker market place for some time and happen to have an ample supply of DPS bottles as I sprinkled a prototyping board with them. If you are interested in buying one you can contact me via my GitHub page. Or you can gerberize the Eagle project, order and build one yourself as this is OSHW, as always.